What is more astonishing, an ugly octopus predicting all 6 games of Germany in FIFA, 2010 or me dying of ulnar hernia? Paul, the octopus with psychic powers, has become a celebrity after accurately predicting the results of matches involving Germany, all 6 of them. The question that arises is whether this phenomenon was worth the media attention it has got. Say, we flip a coin and it lands heads up. Will it cause hoards of mediamen coming running down with their machines? Certainly not. Its a matter of pure chance, one would say. With that insight, lets examine the odds of octopus phenomenon occurring purely out of chance. In a match of football, there are exactly two probable outcomes, i.e., “team A wins and team B loses” OR “team B wins and team A loses.” So, the probability of predicting the outcome of a match accurately is ½ (probability equals 1/number of outcomes). Hence, probability of correctly predicting results of Match 1 and Match 2 = I x II = ½ x ½ = ¼ (multiplication of probabilities of independent events). So, probability of correctly predicting results of 6 matches = ½ x ½ x ½ x ½ x ½ x ½ = 1/64. In other words, if there are 64 equally smart octopuses trying their hands at predicting all 6 matches in a row, one would eventually predict it correctly just by random chance. In yet other words, if there are 64 men/women predicting results of the games by flipping coin, one out of them would get all the 6 results correctly. Now, lets examine the probability of me dying. According to US Social Security, the probability of death for a 16-year-old is 1/1307. Compare that with the rather high probability of 1/64. So, it is far more improbable that I would die compared to Paul predicting all the German games. According to common wisdom, the more improbable an event is the more attention it should harness. However, I (and you too) can be pretty sure that it is highly unlikely that even a line would be printed in the local daily on the auspicious occasion of my departure from this planet. 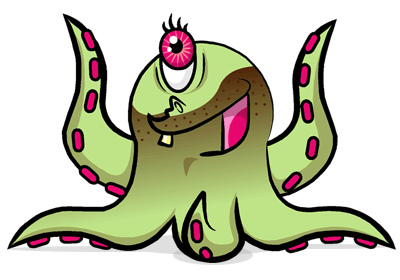 Seems like its better to be an ugly octopus now a days than a human. Hope I made you think about the validity of news that we consume each day. Don't forget to carry a pinch of skepticism along. By the way, you are not predicting the probability of me being a 16-year-old. Are you?